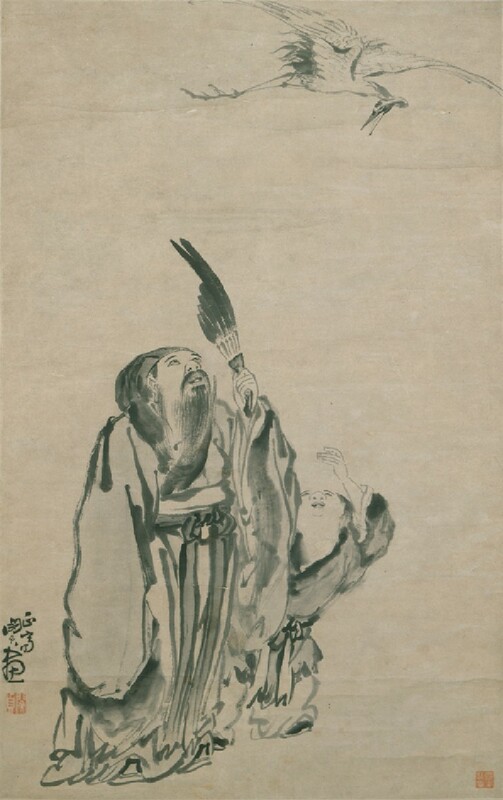 The man holding a feather fan (left) refers to the Northern Song dynasty scholar and poet Lin Bu (AD 967-1028), also known as Lin Hejing. 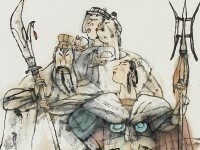 Unlike other scholars, Lin Bu refused civil duties but spent his life as a recluse by the West Lake in Hangzhou. He never married but enjoyed living among plum trees and cranes, claiming the plum blossoms were his wife, and the cranes his sons. The boy behind Lin (right) is his servant, who would set the cranes flying to signal Lin when his friends came to visit, since he spent much of his time on the lake. The artist Min Zhen, also known as Min Zhengzhai or Min Aizi, was born in Nanchang, Jiangxi province and is best known for his figure painting. Min Zhen was born in Nanchang, Jiangxi province but lived mostly in Hankou, Hubei. He was orphaned at an early age and it is said that the indifferent quality of his family's ancestral portraits prompted him to apply himself particularly keenly to studying painting. He was also a skilled seal carver.